TRIFECTA's 2018+ Equinox recalibration is complimented by a fully developed 9-speed automatic transmission calibration to support the increased power delivery profile and to offer dramatically improved driving characteristics for everyday driving maneuvers. The complete powertrain calibration also includes ESC (Stabilitrak) program enhancements. - "T87A" 9-speed automatic transmission controller does not need to be removed from the vehicle or "unlocked"
When the cruise control subsystem is armed (via the steering wheel button), auto-stop works normally, just as it did from the factory. When the cruise control subsystem is disarmed, auto-stop events are re-calibrated with sport and performance strictly in mind (available only with vehicles equipped with cruise control from the factory). If the vehicle is auto-stopped, switching the cruise control subsystem off causes the engine to restart immediately. If the engine is running because no auto-stop event could occur due to the cruise control system being disabled, enabling it will cause the engine to stop immediately, provided all of the other auto-stop criteria are met as well. TRIFECTA: Making Auto Stop more performance oriented. Meet Performance Auto Stop Mode. - Advertised gains are quoted as 'up to' and may be less for a vehicle operated at altitudes higher than near sea level. 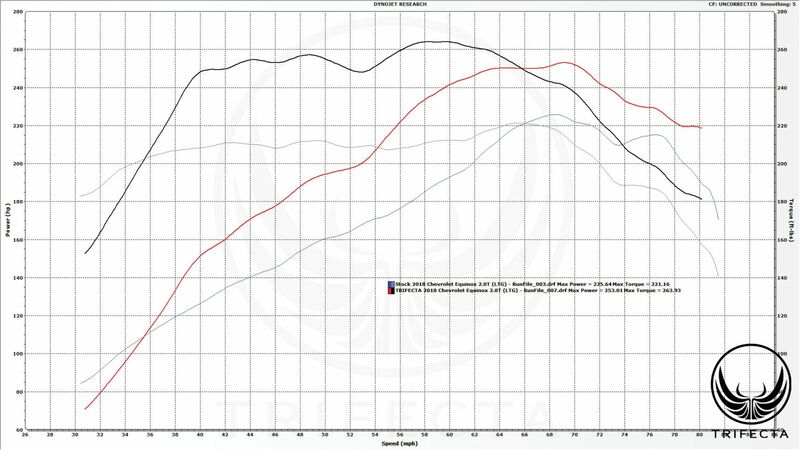 I received the 2.0T Equinox tune today. I had just finished installing it in my wife's car when she came into the garage. I took her for a test drive. OH MY WORD. The tires (Front Wheel Drive) were chirping in 1st gear. We both looked at each other in shock. At the next stop sign, I punched it again and sure enough, the tires spun all of first gear. Major difference. I had driven the Equinox the other day, and it wasn't even close to chirping. This is my 4th vehicle tuned by Trifecta. All previous tunes have been stick. This is my first automatic. All thumb's up again. Yesterday I successfully installed the calibration. Even with AWD activates tires are squeaking when the pedal on the floor. With the K&N cold air intake and tuning on a 105 octane gasoline I guess my Equinox is delivering now a little over 300bhp at the engine. Thankfully and as expected the start/stop is deactivated. Attached the results of dynamometer run. And please let me know in case Trifecta develops any hardware or software upgrade. 2018 Equinox "sleeper". I want to thank Trifecta for the tune. The Equinox now has the feel on acceleration similar to the other cars I've owned. (SRT8, Scarab, Z28, 66 Mustang K code, 66 Fairlane GT, Solstice GXP) No one expects much speed from an Equinox, especially since the majority have the 2.4L - 6 speed ( my 2014 was this version ) The new 2.0L with the 9 speed + Trifecta tune is the answer for the Equinox. I'm a 1st time Trifecta customer, but was so confident in the reviews of their products that I ordered the tune even before taking delivery of my wife's 2019 Equinox AWD Premier. I fully expected the vehicle to be quick once it was flashed, but this little grocery-getter is now quite the rocket ship! Even in AWD mode, it barks the tires on dry pavement and the transmission tune shifts very decisively without being harsh or overly firm. Other than the calibration from Trifecta, the only other additions to the Equinox are a PTP turbo blanket and reflective wrap on the intake pipe coming out of the intercooler. I have owned a number of tuned GM vehicles and have ZERO regrets finally having one tuned by Trifecta. I'm sure to be a returning customer, as my teenager is now jealous that his Cadillac ATS 2.0t no longer keeps up with his mother's soccer-mom SUV! All i can say is Wowwwww!!! This tune with the AWD 9 speed trans is sick. It will still break loose in AWD mode on dry pavement. When i put it in FWD mode it will spin the tires for days. I have pulled away on cars that the NOX has no business running against. I have had 4 cars Tuned by Trifecta and will not have any other company do my tunes.